The date "c.1890s" was not understood. Place made Esty Organ Co., Brattleboro, U.S.A.
Place used The Woolsheds Methodist Church and later in the Wasleys Methodist/Uniting Church. 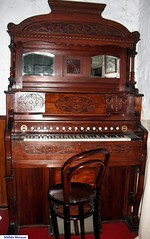 Used in Originally played in a home for the enjoyment of the occupants, it was later played each Sunday in the church to accompany the singing by members of the congregation. 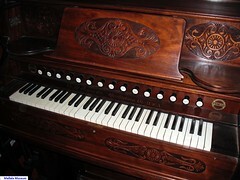 The beautiful ornate pedal organ had been a treasured possesion in the private home of Mr and Mrs W.H. George of Woolsheds, Section 677 Hundred of Mudla Wirra. In 1949 their daughter Mrs Blanche Hancock donated the organ to the Woolsheds Methodist Church which was situated near their home and 3 miles west of the township of Wasleys, South Australia. The organ was used weekly until the closure of the church in 1967 at which time it was donated to the Methodist Church in Wasleys. Many years later the congregation of the Wasleys Church purchased an electronic organ, but the ornate pedal organ remained on display in the church and was played at infrequent intervals. Over the passage of time the electronic organ was deemed unworthy of further maintenance so once again the organists reverted to the faithful pedal organ. The Wasleys Church - now Uniting Church of Australia - closed its doors in 2004 and the congregation kindly donated the organ to the Mallala Museum. 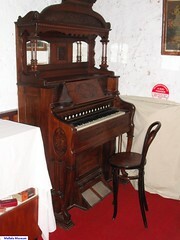 The organ, which is in good working order, is a valued exhibit at the Mallala Museum. The organ stands two metres tall and the ornate timber top is beautifully carved and sculptured and has a ledge for ornaments and two small inset mirrors. A compartment for music books is concealed by the stand that holds the music. A semicircular protrusion on either side of the ledge would have held a lamp. The lid pushes into a cavity to expose the keys made of ivory. A silver plaque on the organ acknowledges the donation from the George family to the Woolsheds Methodist Church. Recent information from former members of the Wasleys Uniting Church Congregation. Do you remember Church Pedal Organ ? Then Join up and add your memory here.